I hate to check to bags. I like to have all of my things with me! When I decided to accept the invitation to attend Social Media on the Sand at Beaches Resort in Turks and Caicos… the first thing that crossed my mind was- What do I pack!? First off… this was not a sponsored trip. I paid to attend the conference and I paid for my airfare. This doesn’t take away from the fact that this was the most amazing trip I’ve ever been invited on. 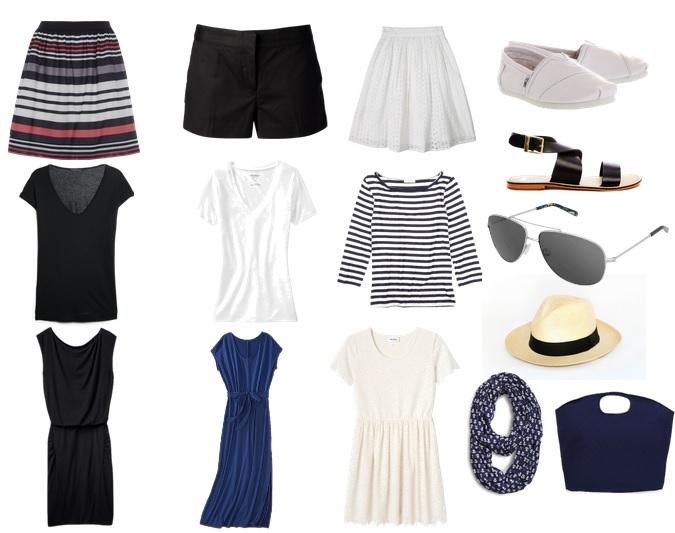 Amazing or not… I wasn’t about to sacrifice my carry on for a week’s worth of adorable resort wear! And this is where my obsession with capsule wardrobes began. It’s a small set of clothes that are able to be mixed and matched to create dozens of combinations. Perfect! This is just what I needed! I jumped on Pinterest and began some serious research. Then I did a survey of my closet and then… I shopped. Here is a representation of what I brought on my week-long, off-season trip to Beaches in the Caribbean. You’ll need 3 easy breezy dresses, 3 basic tops (one patterned) 3 basic bottoms (one patterned). From these 9 pieces of clothing and a handful of accessories, I had the freedom to create 12 “normal” outfits. You could go crazy and start some serious layering (as I’ve seen on many posts like this) but I’m not one to layer skirts or shirts over my dresses. You could also add the awesome scarf to everything and count that as a “new” option, but I’m trying to keep it real here. My t-shirts are from Target. V-neck boyfriend style are the best fit for me. I can also credit Target for my uncontrollable scarf, bag and hat addiction. The beachy, jersey knit dresses in my closet are from Old Navy (mostly). I do want to make one HUGE shout out in this post to Iristocracy. They gifted conference attendees with their choice of sunglasses. I chose these polarized Ted Baker aviators. Awesome. Right? I hope that this post has inspired you to look at how you pack a little differently. Save space. Travel light. Relax and enjoy your trip! *Disclosure- I was not paid to write this post. I’ve given all the trip details and information on my gifted sunglasses within this post.